Doma Architects were asked to design an extension and reconfigure the existing doctors surgery building to improve the patient experience. This involved the incorporation of a new independently run pharmacy unit, addition of a new lift to provide access to the first floor, a larger first floor waiting area and new accessible WC. Doma Architects designed a new two storey extension to house 6 new consultation rooms, and reconfigured the existing building to provide more efficient use of space. 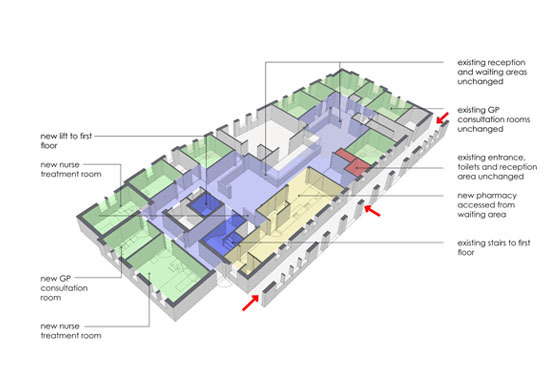 This included consolidating all staff areas to one half of the first floor with all patient areas to the other half. Doma Architects administered the project on site and worked closely with the Doctors and contractor to achieve a high quality building that complies with the strict Care Quality Commission criteria, whilst creating a patient friendly environment.